Stock Beta is the measure of the risk of an individual stock. Basically, it measures the volatility of a stock against a broader or more general market. It is a commonly used indicator by financial and investment analysts. The Capital Asset Pricing Model (CAPM) also uses the Beta by defining the relationship of the expected rate of return as a function of the risk free interest rate, the investment's Beta, and the expected market risk premium. To interpret and understand the numbers from the Beta is simple and straight forward. The Beta of the general and broader market portfolio is always assumed to be 1. A stock Beta is calculated to be relative to the Beta of the broader market. Thus when a stock has a Beta that is greater than 1, it is considered to be more risky and more volatile than the broader market while a stock with a Beta of less than 1 is considered to be less risky and less volatile than the broader market. Finally a stock with a Beta equal to 1 is considered neutral and as volatile as the broader market. The following formula is used for calculating the value of Beta. Covariance is a measure of how two variables change together or is related and Variance is a statistical measure of the dispersion of values from the mean. The rest of this document will illustrate on how to calculate the Beta of an individual stock against the broader S&P 500 portfolio. The interesting part is we will be downloading live data from https://finance.yahoo.com to perform the calculation. Stock Symbol - The Stock Symbol used by Yahoo Finance. For example, "YHOO" is the stock symbol for Yahoo. "MSFT" is the stock symbol for Microsoft. Check out https://finance.yahoo.com for the list of Stock Symbols supported. Start Date - The start date in MM/DD/YYYY format. End Date - The end date in MM/DD/YYYY format. After clicking on the Calculate button, an Excel VBA macro will be launched to download the Monthly Stock Quotes from the Start Date to the End Date of the specified Stock Symbol. The Monthly Returns in column H and column P are then tabulated in the StockBetaInternal spreadsheet. Before any calculation, please make sure you are connected to the internet. The Stock Beta is calculated as the formula below. Supports the calculation of Beta for up to 5 stocks. 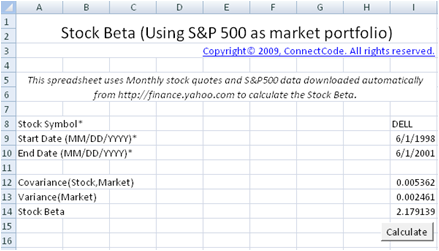 The Stock Beta Calculator only supports the calculation of Beta for one stock at one time. The professional Stock Beta spreadsheet is free for a limited time! Click on the Details page above to get it now.